But Bombay is Bombay and holds its own in the world of extravagance and drama. It has been special since I came back from Paris. The most beautiful of experiences eclipse its somewhat lackluster infrastructure, its lack of beautiful parks and buildings – the people and the warmth and the chutzpah make it one of the wonderful-est cities of the world. Seems like yesterday, Jan 2011: breezy butterflies at the races, air-kissing under hats and skirts swirling flighty-ly – it’s all so, so breezy-airy-fairy!!! And here I am, 2012 at the races, in my pink floral Harrods hat, same spot one year later! How time flies isn’t it? If you were to ask me what the one party trend was, that defined Bombay’s entertainment whirl for 2011, I’d say it was destination parties, weddings and soirees. Bombay, the epicenter of trends in India, reinvents its party mantras all the time. Mid-air fashion shows, exotic island parties, yachts, hotels, resorts, palaces, mountains. In the midst of angst-ridden metro life, the magnet for chartered planes, gowns, hats, airport breakfasts, lunches on hill tops, is at once exhilarating, calming & liberating, taking you into timeless other-worldliness, out of your sphere of date books and time slots. What soon followed suit was destination launches and opening previews. And it was definitely a year to remember, even with its low notes that marked the year poignantly. The stock exchange bombing put a dampener onto all our joie de vivre and took me back to the horrors of 26/11 which brought home our city’s weaknesses – still ill-equipped to handle terror attack sans cutting edge intelligence to prevent this. The cops of our land should stop wasting their time trying to catch people dancing at discotheques!! We are held at ransom at the hands of some geriatric self-serving politicians. A party is, after all, a recreation meant to relax you, and we treat it like work sometimes. “Groan, one more ‘party’ we have to ‘show face at’”. And so the escape of destination parties, where you breakfast and lunch and then dance and talk and coffee the night through, is extraordinary. Early last year it was supposed to be one of the most grand social events of the year! First class was toasting its way with pink champagne to Hydrabad and Falukhnamah Palace, the Grande Dame of the Nizams city! And wow what a weekend it was! Starting with the high tea at the fountain patio, to the brunches in the never-ending chandelier-ed dining room, dinners in the rambling gardens, night caps with blues and jazz on the portico, high up in the palace overlooking the Hyderabad skyline, to champagne cocktails at the extravagant domed central halls! Maharaja Arvind Singhjee Mewar, his son Lakshyaraj Singh Mewar and sister Padmaja, who at first glance doesn’t show the chutzpah she’s capable of! Pinky Reddy & Sanjay Reddy, Raymond Bickson. Tourism minister Selja Kumari, and of course the toast of India, Mr Ratan Tata were also in attendance. Minni Menon flew in with daughter Lola Kutty from Madras, and Sabyasachi Mukherjee from Calcutta. Renu Basu, Rakhee Lalvanee from the Taj. Hollywood stars Bo Derek and some others whom I didn’t know; when I asked Bo for a picture with her she said ‘No but instead, may I have a picture with you, are you a princess?’ Quite obviously I flew back home literally and metaphorically! This pageantry and drama flagged off the party year 2011 where the revelry did not stop despite the torrential rain! and drama of Falukhnamah. Close friends flew in from all over the world for an annual reunion. From parties at Meharangarh Fort, to sit-down dinners at the crystal dining room, teas and breakfasts in patios and themed rooms done by Edwardian architect Henry Lanchester in the resplendent palace that is a blend of eastern and western architectural influences, it was resplendent fare. The cocktails and teas under the majestic Renaissance influenced, 105-foot high cupola, and the winding down at the blue sea theme spa painted with fresco’s from the sea (reminiscent of Greece), were my favourite. All together it was a memorable weekend party. Delhi’s new wow destination, Leela Palace, located in the heart of Lyuttons, Delhi, was a grand surprise. More glitzy but no less in grandeur to the palaces I’d caroused at. We were flown down by the Nair family, into the stately palace hotel with high atriums and banquet halls, splat bang into a multi-cuisine multilevel celebratory lunch party. The finale was the ball at night where the entire hotel was the party venue, from the rooftop to the lawns. Cavali gowns, Balanciaga trains, Asprey butterflies adorning decolletages of many a creamy bosom. Rambunctious music wafted through a luxuriant, long party evening. Madhu Nair, who had worked her magic on the interiors, saw to everyone’s comfort while Captain Nair was busy holding court and telling his unique story. Laxhmi Nair ensured that every one was given personal attention and welcome, along with a personalized picture, that was later framed and gifted to all guests. This hotel is a modern day palace with the nuances of an old world magnificence. 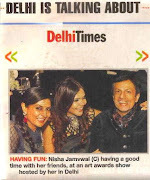 Naari Hira’s party for Magna, held at his own penthouse, was glitzy & buzzing with Bombay’s fun and famous. Naari is the pasha of Film journalism, who brought the lives of Bollywood and all its masala into the homes of the lusting-for-cinema Indian. Bottom line is that Bollywood it is, that adds the X factor to Bombay. Aamir Khan came with Avinash Gowarikar, his photographer friend, Piyush Pandey, Shobha De, Parmeshwar Godrej, Talat Aziz, Urmila Matondkar, publisher Ashok Advani, director Madhur Bhandarkar and all the stars, wannabe stars, starlets mixed with the brilliant editors Suchitra Iyer, Andrea Costabir, Mario Ferriera, editor in chief Ashwin Varde, were the soul behind the evening. A memorable evening indeed, from the 30th floor, overlooking Bombay’s twinkling lights. Somewhat reminiscent of Madhur Bhandarkar’s films that caricature Bombay’s ingénues’, stars and socialites in kitsch drama. Annual Show. Wow, the young minds have such a plethora of ideas. I was endeared to them, as I was later was by ‘Talash’, another student festival, and all through the year by Jai Hind, KC College, Poddar, SIES College & Garodia College Of Design, all where young vibrant minds had put forth their fashion extravaganza’s, Design Projects and shows; the most difficult part of it all is the ‘judging’ I must do at the end of every evening with them, because I can see the passion and effort that goes into it all. And yet there must be one single winner, isn’t it? So I’m saying cheers to all the ‘winners’ (even though there was a first, second and third place declared) – to those that took the gumption to present, walk the ramp and run the race (metaphorically speaking), they are all winners for me. relationships come out triumphant to succor and comfort. An endearing trend this year was all our friends celebrating our lovely Madhu Nair’s birthday, loved by one and all – we nearly had a festival which strangely bonded us more ‘cos we were meeting all the time to celebrate, like a festival. I’ve resolved to embrace this trend, and celebrate good buddies. So here’s me committing to have a soiree for my close friends !!! quite a party whirl, you do so much and manage to look good, how come?